I didn’t attend Rollin’ On The River, but since it is one of the primary races on the Midwest race calendar, I wanted to get an opinion of how the race went, specifically from someone who raced in the advanced/rec division. The race took place on August 16, 2014. You can find full event information at Inline Skate MPLS here. Since I didn’t participate in this race, I asked Mike Williams to write a race report. The following is his race report. Thanks to Mike for writing the report. I hope I can do this for other events in the future, particularly reports from the Advanced and Rec groups. Rollin’ on the River is quickly developing a reputation as one of the best run inline road skating races of the season. As such I felt it was imperative to get there and show as much support for them as they do for us. That is saying something because Grand Forks can be a tough place to get to. The trip over was fun. I shared a ride with Pat Stream and Chris Mackowski. Pat and I used the time to pick Chris’ brain on all things skating. We talked about warm up strategies, mechanics, and some race day tactics. The five hours passed quickly. After packet pickup things got hectic. We desperately wanted to strap them on and roll over the bike path section of the race course so we headed out immediately. It was a complete blast. 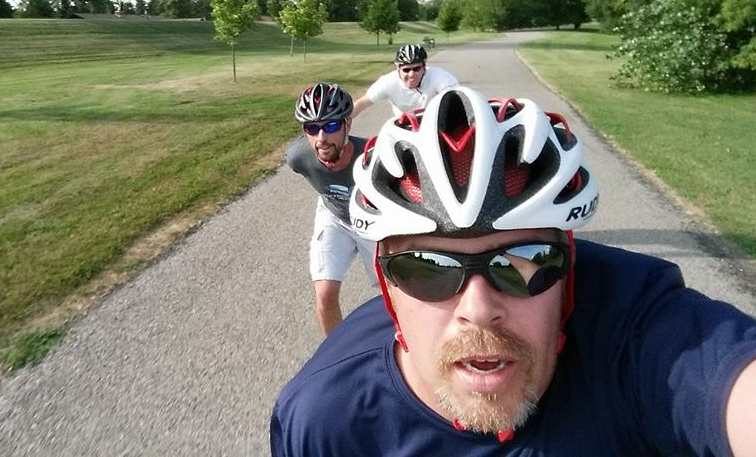 Pat got some great selfies and I got to hang on Chris’ wheels and get a feel for his mechanics in action. When I was able to align with his tempo and grab some underpush it really felt like things were clicking. This might have been the best part of the trip. A local told us this path basically surrounds the city. I may just have to do an extended say to check that out sometime. All went as planned in the morning of the race. We got there in time to be the first ones on the first bus – which ended up being more fortuitous than it probably should have been. The race did a great job with feedback and added some port-o-potties to the starting area. The legs were feeling a little heavy. I did five minutes of stretching and about 10 minutes of light skating for a warm-up. I never really pushed out the heaviness. My only suggestion would be to give us all more time by starting buses a little earlier. The race was a mass start. The Pros and us Recreational skaters all started at the same time. My tactic for the start was to pick someone I know to be slightly stronger and more experienced than me and pin myself to him. Matt Melanson and I had finished close together at Apostle and I was happy with the idea of that happening again, so he unknowingly became my rabbit. Also, the race is basically a straight shot for the first 18 miles – and today it was into a headwind. That meant being protected with numbers will be the key to not only a fun day but a competitive day. The start was surprisingly slow. It was clear right away that everyone was waiting for the Pinnacle team to make the first move so no one set a strong pace. The bulk of the field was still together a full mile into the race. When the pace finally quickened I was still on Matt’s hip. It was clear he was trying to get onto the chase group and I was ready to give it a shot. But, in the chaos we had let too many less ambitious skaters between us and the group that finally went. By the time we got clear of the mess there was a good 50 foot gap. Matt and I worked hard (and together) for about a mile until we realized they were too far gone. At that point we looked back, saw a big gap behind us and said, “At least we might be able to stay away from everyone else”. We worked hard for the next couple miles until we saw that the group behind us was closing the gap quickly. The wind was just not going to let anyone succeed without lots of help. We eased up and took a breather until we could latch on. This ended up being the exact right group for me. Seven of us I think. Every one took strong pulls into the 10mph headwind we had the first 15 miles. The group stayed together until mile 18 when it transitioned from the road to the bike path. The pace quickened when Matt took a long pull and things started to change quickly. We caught a couple folks who had fallen off the chase pack and couple others fell off our line but the core group remained about 5-6 skaters. At mile 22 we left the trail and hit the residential neighborhood roads. I completely lost track of direction as the pace clicked up even a little faster. Left turns, right turns, briefly on another bike path and finally – there was the finish line. I was just hanging on at this point – there we no more pulls in my future. I was fourth in our group going into the final turn. I was passed by a couple in the last 100m when I completely ran out of gas. I spent everything – nothing was left. As it turns out many of the folks who beat me in the home stretch registered in the Pro class so I ended up in 3rd place in the Rec class. Often I look back at a race and can think of a few things I could have done better. Honestly, I can’t think of anything I would have done differently. There was no way I was going to hang with the chase group (they finished 9 minutes ahead of us), and I didn’t let my ego burn me out with too long of pulls at the front of our pace line. If I had to find something to improve I would say I missed my goal to get 20 minutes of good skating in for a warmup. As far as technique goes, I certainly spent too much time on my inside edges on straight legs. Overall though, I’m happy with my decisions and focus. It was a great event. I’m definitely going back next year. Grand Forks is really into it. They have inline speed skaters on their travel guides. The race even got coverage on the evening news. They give prizes for all participation classes. A lot of people question the value of the Minnesota Half Marathon. However, after the race this year, this event should be considered a staple of the Midwest outdoor racing circuit and anyone within reasonable driving distance should put this race on their calendar. I have often felt that this race rejuvenates my confidence as a skater after the Chicagoland Inline Marathon, as I haven’t been able to keep up with the main pack at that race since I have raced it. Coming out of the Chicagoland, I was aggressive with the two weeks of training I had getting ready for this race. I like this race, generally, even if it is only a half marathon. The road conditions are decent, there aren’t a lot of big hills, and the pace is pretty fast. This is a local race for Minnesota skaters, and it usually draws a big crowd from the local speed skating contingent here. This year was no exception. I got out of the house and on the road by the time I had planned, but didn’t get to St. Paul, where the race took place, until 7:15 AM. The race was scheduled to start for the Open Wave at 7:33 AM, so I was very late. The line for parking was long, and I still had to get to packet pick-up and get my skates on before getting to the start line. The gear drop was also in an odd place. Thankfully, one of my teammates from Team Rainbo was kind enough to drop my gear bag for me at gear drop while I got my skates on. When I checked in and got my bib, I didn’t get an ankle chip. I made it to the start line, but just barely before the National Anthem. I got in with the group of skaters in the open group, but was shuffled a couple of skaters back from the start line. The conditions were tight, and it took a bit to get across the start line. At the start, the pace was predictably fast through the turn around. The main group filtered out after a couple of miles. We had a solid group through the first half of the race. Oddly, at about mile 5.5, I was pulling the line and found myself alone. I looked back to see the line dropping off behind me. I knew I wasn’t going to be able to hold that pace through the rest of the race, and opted to let the line catch me. We rotated out, I continued to draft, and as we approached the turn around a couple of skaters got away. Cale Carvell gave chase, and caught the group on the flyer. The line broke up a bit up the hill to the turn around, and I opted to see if I could catch the flyer. It took about a mile, but I managed to reel them in. Unfortunately, the rest of the pack came with us. The last couple of miles were very fast. I managed to duck in behind Roger Olson and hang on to the finish. We were cruising into the final sprint, and I looked to my right only to see one of the other skaters closing, so I shot my right foot out to cross the line first, finishing in the top 5 for the wave, first for my age group, and 33rd overall, finishing in 42:02.30. Full results can be found here. The open wave was lead by Matt Melanson, Cale Carvell, Roger Olson, and myself. However, the official results list Dan Stietz as finishing first, though I don’t know we ever saw him in or around the main pack, and he finished about 3 seconds ahead of the pack. There was some great racing in the open division this year. Inline Skate Minneapolis‘s race report from the overall event can be found here. Kelin Dunfree pulled out the overall win, followed by Rob Bell and Alex Fadek with Hernan Diaz and Team Rainbo’s Steve Meisinger rounding out the top five finishers. Kaari, over at the Longtrack Life also pulled out her inline skates and raced the event. Her race report can be found here. My technique was better in this race, but after watching the video and observing some of the other skaters, I can say that the big problem with my technique is where my center of gravity sits over my skates. The other fast skaters have their center of gravity further back over the heels of their skates. Mine tends to be over my skates. I noticed this after the Chicagoland, but this certifies the problem. I have been working on this aspect of my technique. I need to get my balance and weight farther over the heels of my skates, and I will continue to work on this body position. The big benefit of doing this is it forces me to push out to side more effectively, thereby transferring power to the ground more effectively to generate more speed. I used DashWare to make the gauge overlay for this video. This process is shockingly more cumbersome than using CycleCam. CycleCam creates the gauge videos with just the use of the Garmin TCX file. However, it doesn’t have very many options for gauges. DashWare has considerably more gauge options, and the gauge designer is very powerful, though not entirely user friendly. DashWare, though, is designed to make the entire video, start to finish. DashWare has options for titling, but isn’t very capable as an editor. I had to make a background to make the green screen so I could use chroma key to overlay the gauges on the camera footage. I like the gauge options, but you have to render the video with audio in DashWare then edit the camera video and gauge video in Lightworks. I am going to keep working with DashWare to see if I can construct a viable workflow. I will have a review of DashWare specifically in the near future. 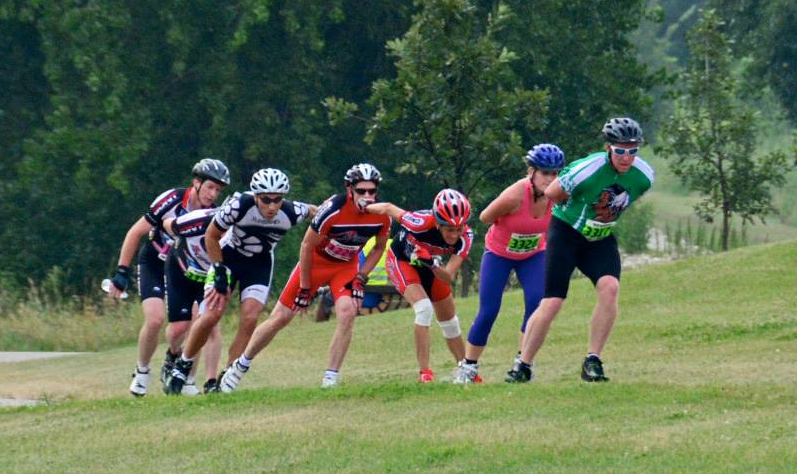 This year, the Chicagoland Inline Marathon took place on July 20, 2014. The weather is usually a source of concern for this race because, as one friend and fellow racer of mine put it, its like racing on the surface of the sun. It is usually brutally hot and terribly humid, but that is what you get when you schedule a race in the Chicago area in July, basically the dog days of summer. This year, though, the race start for the Advanced division at 8 AM, the weather was reasonably pleasant. The temperature was in the mid 60’s and the humidity was around 70%. The Elite group had a little tougher time weather wise, but it never got much more humid. Generally, pleasant conditions for skating, all things considered. The race started shortly after 8 AM, and the group came off of the line typically quick, with the speed of the lead pack jumping quickly up to 20 MPH. As the group thinned to the 20 of us, or so that could hold that pace. The pace stayed in that range, and for the first half of the race, we were averaging 18+ mph even over the hills. Last year, I got dropped after the the hills on Central, headed up Huntington toward Lakewood. This year, I managed to stick with the lead pack through the entire first lap, and through the long outbound stretch on Central to the turn around about 12 miles in to the race. For this race, it is the longest I have managed to stick with the lead pack. Like previous years, we lost half of the pack on the hills on the return on Central. This group got together and hung together for the rest of the race. The lead pack put some good distance on them in the half of a lap or so after we got away. However, it wasn’t too much longer before I lost the lead pack. At the turn around, I got shuffled to the back of the pack. When we came around the corner back onto Central, I had the opportunity to jump up the line, but, mentally, I wasn’t there, and miss the opportunity. The guy in front of me lapped the line, and I got stuck in the accordion effect of the sprint back toward the hills on Central. I couldn’t get my legs under me and sprint after the pack to stay in the draft. I lost the pack after 12 miles, and then skated the remainder of the entirely alone. I tried to pick up a skater or two on the way, but wasn’t able to find anyone to skate with. Another skater was on my tail, but not closing fast enough to allow us to work together. I think we both may have done better if we managed to connect and work together. Regardless, after seeing one of my team mates with a bit of a lead, I was hoping to catch him. Unfortunately, I couldn’t close the gap and I spent the rest of the race in no-man’s land, skating solo in the wind, fighting for every minute I could manage. I finished the race in something of a disappointing 1:35:20, 5th in my division and 16th overall in the wave, as I hoped to finish around 90 minutes. However, I do think this is one of my highest overall finishes at this race, which does give me some hope that the work I have been doing on technique and fitness are helping. This time was better than last year, but not better than the year before, which was a personal best at this course, if memory serves. The advanced division race results can be found here. The rest of the results by category can be found here. This race is challenging. While the road conditions get a lot of complaints, that isn’t what really makes this race hard: it’s the hills. To race Chicagoland, you have to be ready for hills, intervals, and hot weather. Without that combination, you won’t last. The road conditions are just another layer that will separate those who are comfortable skating on any surface from those who aren’t. I will keep attending this race because I like the challenge. I wasn’t prepared mentally, and could have used a little better physical preparation, but I learned a lot (like how my form on hills falls apart when I get tired, leaving me with heel blisters to remember the experience). My hips were pretty sore after the race, too, which also gives me confidence that my work on technique is helping as the kind of soreness and fatigue I came away from the race with is a good indication that my technique wasn’t as bad as my feet would have me believe. That said, the goal for next year is to hang with the lead pack through the entire race. I have a better idea of how to train now, generally, and will be adjusting my off season work to accommodate a lot more base cardio, something I missed this last winter. Mixed with a strong helping of weight lifting, a little bit of ice skating, and a mix of other things that I will probably discuss more at length come October, I am hoping for a stronger finish next year. Overall, I can’t complain much about this race. I did better than last year and placed higher, overall, than I have at this race. My time wasn’t spectacular, but given the other gains, I can’t say that this race was a total loss. I know now what I need to work on, and if I am not learning something in this sport, I am doing something very wrong. From a gear perspective, I have been messing with my frame placement, and I think it was a little off on both skates, but more so on my left skate. That is where the biggest blister was after the race. I skated some earlier this week and noticed the placement issue. I moved the frames in a couple of millimeters, and they feel dialed in at the moment. I am going to stick with this placement for the near future, probably through the end of the season. While cleaning my bearings before the race, it became apparent that my Adam’s Swiss bearings were dead after not being properly clean after getting wet during the Apostle Island race. It was a stupid mistake that forced me to replace the bearings with ILQ9 Pro bearings. I like the ILQ bearings from TwinCam generally. They are a good product, but I wish I had more break in time on them. They roll very smoothly, and I couldn’t complain about the team price. It is also what a lot of the guys that skate in Minnesota run, too. The WRW Truth wheels seem to be doing reasonably well, but they are wearing more quickly than I anticipated. I will have to see how they fair over the next two races to provide a better review. Any experience I had at Chicagoland this year will be colored by a lot of other gear changes that contributed to my struggles in this race. The next race is the Minnesota Half Marathon on August 2. I don’t feel ready for this race, but I didn’t feel ready for Apostle Island this year or the Minnesota Half last year. My goal is ambitious, though I don’t know if I am capable. Last year, I accomplished my goal of staying with the lead pack. This year, I am shooting for a top 10 finish in the open division. Roll for the Roses is a local event in Roseville, Minnesota, that is basically a 5k and 10k run event with a 10k skate event tacked on to the start, probably because there are so many inline skaters in the Twin Cities. Total, there were 57 skaters signed up for the 10k, with more than half of them in the Pro division. There are two divisions, Pro and Recreation. Pretty much everyone in the pro group is skating on low cut speed boots. The start is a group start, so everyone in the event starts together. It is legitimately an event less so than a race as this kind of event should attract a lot more recreational skaters. For the speed skaters in the bunch, though, this event is pretty much a sprint. A 10k is a warm up for skaters that usually race 42k. This year, there was actually a race. The weather was hotter, in the mid to upper 70s, and it was humid. It has been raining a lot, and the forecast called for more thunderstorms, but thankfully, they ended up holding off until later in the afternoon. We didn’t get any rain during the day in Rochester, and it didn’t start to rain until later in the evening. The humidity could have been worse, though. It is a fun local race that is worth the drive from Rochester. I am glad we have a local short course race. I think that we need a lot more of these all over the country. Since this race is in the Twin Cities, all of the really fast guys come out to race. I was hoping to jump in with the lead pack and hold on as long as possible. However, I made it to the event late because of some road construction and started probably 30 seconds behind the last skaters. As I was skating toward the finish line, the gun went off for the start of the race, and the main pack went flying by me as I was skating the other direction. I made it to the start line, turned around, and sprinted to catch up. I bombed from the start through the rec group and caught the the chase pack that had fallen off of the leaders within the first mile. The main pack was too fast, and we weren’t able to catch them. The course is a road course that has blocked off sections of local roadways that starts near the Roseville Skating Center and finishes in the oval. The road wasn’t in the best shape, and part of the course went through some subdivisions with road work, that resulted in loose stone on the roadway. It almost took out one skater in the group I was racing with. There is also a good number of tar snakes and hills. On the whole, though, the roads aren’t rough, or they didn’t feel very rough. I raced on my World Record Wheel Truths, 110mm wheels at 87a hardness. 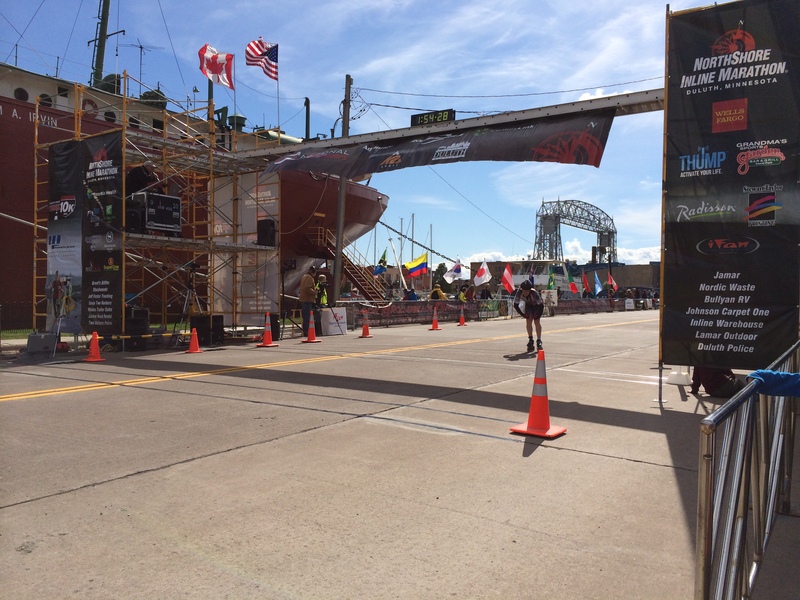 These are the same wheels I raced the Apostle Island Inline Marathon on earlier in June. The hills proved to be a challenge as there are a couple of big ones. We almost caught one of the guys that fell off of the main pack, but the hills proved to be the great equalizer. The final couple of turns include a 90 degree left hand turn and a narrow downhill right hand turn that leads onto the main level of the Roseville Oval. The oval surface is amazingly smooth, and once on that surface, I was able to put the hammer down for a 300m sprint to the finish around the corners and along the back straight away. I was hoping to have video, but in the rush of trying to get to the start line, I must not have set up my Contour properly as it didn’t record. Hopefully next year. Chris Lomen of SkateLove did get helmet camera video of the lead pack, though. Official results can be found here, and Inline Skate Minneapolis has a good write up of the event, also. I finished 24th out of 30 in the pro group, and 26th overall out of 57, in 23:02. Not bad considering I started all the way at the back. Average pace wasn’t great, 16.2 mph. It was a gun start, so when the horn went, I started with a good 30 seconds to make up. I learned a lot during this event. First, I need to skate more hills. Second, I haven’t been working out hard enough during my training skates because I woke up sore this morning. Third, technique is king, and I need to get a lot lower while skating. I talked to Chris Lomen after the race and he and I discussed how best to go about this as I train for the Chicagoland in a couple of weeks.